A former charitable centre converted into one of the most modern, cutting-edge venues in Barcelona. 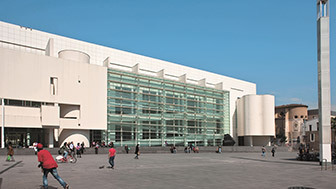 This is the Casa de la Caritat, home to the CCCB, the Centre de Cultura Contemporània de Barcelona, with exhibitions, creative events and a patio where visitors can take in the fresh air and enjoy the modern surroundings. The Casa de la Caritat, or House of Charity, was established in the early 19th century as a place for accommodating the city's beggars and forsaken people. It was a means of reducing poverty in the area but, over time, this building, built during the splendour of Modernisme, has come to serve a very different purpose. 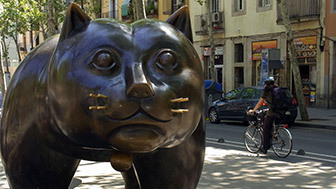 The Casa de la Caritat is now a cultural complex which, situated in the Raval neighbourhood, has filled the area with art and culture. The Barcelona Contemporary Culture Centre, or CCCB, is housed in the main building and it is here that the most modern aspects of the city's culture can be seen: exhibitions, concerts, debates and festivals, always with a focus on new technologies and new languages. An ever emerging space of creators and artists which has a theatre and a laboratory centre for new creations and which forms part of the Raval Cultural project, an initiative that aims to provide everyone with access to the neighbourhood's artistic and cultural heritage. The project to convert the Casa de la Caritat into the CCCB won the FAD Design Award in 1993. A welcoming prismatic structure and a glass facade, which appears to be leaning over the Pati de les Dones, have become one of the city's key landmarks. The mirrors and their reflections are a metaphor for the way the city's landscape is constantly changing, without losing its essence. 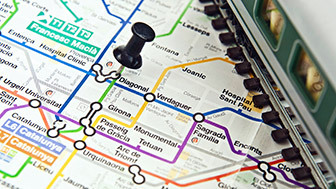 In the centre there is a square, Plaça de les Dones, around which there is the Ramon Llull University and spaces belonging to the Museum of Contemporary Art which complete the centre's cultural offering. The Pati Manning, the former cloister of the Casa de la Caritat seminary, is worthy of a special visit. It is a 17th century cloister, nestled between the avant-garde and the new artistic languages. A cloister that, with its semicircular arches and sgraffito on the walls, speaks of a history which is very much alive in a building that has managed to transform itself into an important cultural focal point. A good time to visit it is during the La Mercè festival, which is when the traditional giants from all the surrounding neighbourhoods are installed here.